Death from a snake envenomation in North America is quite rare. All viperids have hinged fangs that are solenoglyphous (hollow). These fangs can rotate back and forth. When the mouth is closed, the fangs fold back against the roof of the mouth and are enclosed in a membranous sheath. The left and right fang can be rotated together or independently. If a tooth is lost, it is replaced, similar to a shark’s mouth. When a snake strikes, the speed is lightning fast. The mouth of the snake is nearly at an 180o angle as the target is approached. The generally accepted distance for striking is half the length of the snake. Most bites are defensive due to the snake trying to defend itself or being startled. Snakes have no interest in striking humans. Many times, a warning rattle is not heard since the snake was startled. The Agkistrodon species do not even possess a rattle. Up to 20-25% of snakebites are “dry” bites, meaning that no venom is actually injected. 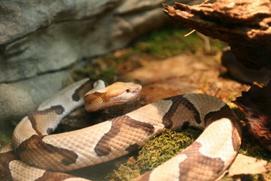 The most common envenomation in Tennessee is from the copperhead snake (Agkistrodon contortrix). Fortunately, these envenomation's tend to be limited to tissue toxicity and most of these envenomation's do not require antivenom. Tennessee is also home to the cottonmouth (Agkistrodon piscivorus) whose name is derived from the behavior of opening its mouth to show the snowy white buccal mucosa. 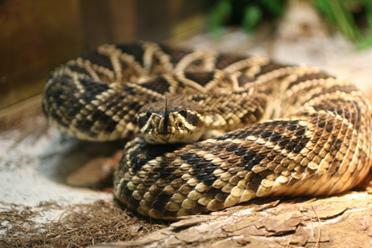 Tennessee is also the territory of the Timber rattlesnake, Crotalus horridus. Envenomation's from the Timber rattlesnake can be quite severe and present with cytotoxicity, hematotoxicity, and neurotoxicity. In addition, there is a Western Pigmy rattlesnake (Sistrurus miliarius) that resides in Tennessee, but this species is rarely involved in envenomation's. The Eastern Diamondback Rattlesnake (Crotalus adamanteus) is not usually found in Tennessee. Their range is along the coastal areas of southeastern North Carolina extending to Florida and Louisiana. If the bite is on an extremity, immobilize it.